Leaky toilets. Clogged pipes. Broken A/C units. The type of maintenance requests property managers receive depends on the size, age and condition of the building. But whether managing brand-new high-rises or condos that are full of character, there’s one complaint every multi-residential property manager will deal with eventually — pests. Perching Pigeons: Tenants aren’t the only ones who enjoy spending time on balconies and porches. Birds of all kinds will flock to exterior railings, dropping bombs on anyone or anything that’s below them. Homeward Bound Bed Bugs: These pillow-loving pests don’t only hide out in hotels. Tenants who travel frequently might inadvertently bring bed bugs back home if they happen to stay in an infested hotel. Garbage-Loving Cockroaches: The inside of the building may be pest-free for now, but if the trash cans are placed adjacent to main entrances, cockroaches will quickly find a way indoors. If you’ve noticed similar patterns at your property and don’t have a robust Integrated Pest Management (IPM) program already in place, it’s time to investigate your options. From an initial assessment to implementation to year-round monitoring, a pest control professional can help you develop a plan that’s built around your building. 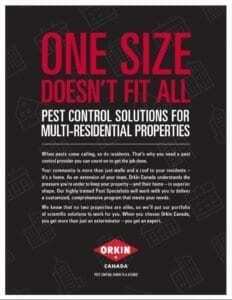 But in the meantime, you can download this guide — One Size Doesn’t Fit All: Pest Control Solutions for Multi-Residential Properties — to learn more.